Standard - $26.99 Only 4 left! Give in to the Dark Side! Actually, the Dark Side isn't as bad as its reputation makes it sound. Okay, the Sith have done some pretty bad things (and blown up some planets...), but do you think they still would have done all that if everyone had just stopped referring to them as "the dark side" or calling them evil all the time? Maybe if the Jedi had sent them a nice peace offering instead of always trying to stop them, they would have all become friends. Yeah, right, and maybe mynocks will fly out of our noses! Well, it's still funny to think about. But, if a Jedi "were" to give a nice gift to a Sith Lord, it could be something like this Star Wars Darth Vader Face Light-Up Pumpkin. A Sith would appreciate such a thoughtful gift, since everyone knows they love black. And they would be tickled to see Darth Vader's famous mask featured on it in nice, festive lights. 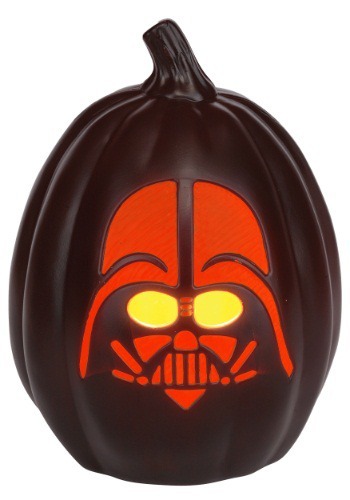 We may never know if this light-up pumpkin could have stopped centuries of conflict between darkness and light, but we do know it will brighten up your Halloween decorations!